MP3: Brown Shoe - "Colt Rider"
To say the members of Northern California indie rock band Brown Shoe are a musical family is somewhat of an understatement. Brothers Aaron, Bryson, Ryan and Landon Baggely - and longtime friend Chandler Clemons, have been together since their days as scrawny-armed kids cannonballing off the Salmon Falls Bridge not far from their hometown of Folsom, California. After recruiting Bryson to play bass in the early stages of the band, founders Ryan and Aaron recently decided to pull from the seemingly never-ending list of Baggely's (eight altogether), and call on Landon to replace their departing drummer. 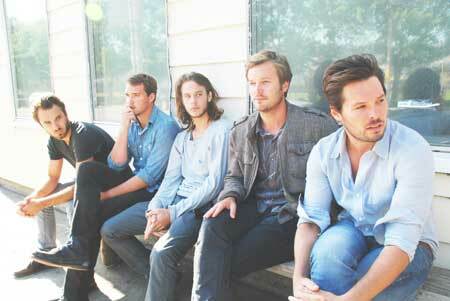 Brown Shoe's current lineup now consists of 4 brothers, taking them one past Kings of Leon's tally of musical siblings. The epic sound the band makes is anthemic and tinged with the sun of California and has been compared to Band of Horses, Fleet Foxes, My Morning Jacket, and REM, to name a few. Most importantly, they are out to make music that will "change the tone of your day," as Aaron puts it. While their third album, Jackalope (2008), had Brown Shoe charting on CMJ, accumulating TV placements, and traversing North America with over 100 dates, their latest album, The Gift Horse, seems destined to take the band to even bigger heights. To be released this fall, the album is filled with a new sense of depth and gravity, partially imbued by a recording process plagued by Ryan's extended hospital stay due to a rare blood infection. The Gift Horse is Brown Shoe's most cohesive album to date, addressing a maniacally expansive tale of love gained and lost twice over, all laid out against the band's soaring harmonies, reverb-glistened guitars, driving rhythm section, and subtle keys. On the album's first single "Colt Rider," Ryan asserts that beyond its surface-level pop sensibilities, there is something deeper: "the inspiration for the song came from a young woman conflicted by what she desires and what other people desire for her." The song hits its stride during the breakdown in the middle of the song. "Aaron started playing an adventurous lead over a somewhat subdued part of the song. I think the rest of us were skeptical about how it would work with the conflicting melodies. But it just adds such a feverish element that is really the essence of the music and lyric," says Ryan. Please contact Megan if interested in talking with Brown Shoe. Brown Shoe is made up of four brothers—Aaron, Bryson, Ryan and Landon Baggaley—and Chandler Clemons who might as well be a brother. Their previous three albums received broad radio play, charted on CMJ, and garnered numerous TV placements. In recent years Brown Shoe has crisscrossed North America a number of times, playing festivals, clubs, and colleges, winning over a diverse fan base across the country. After touring in support of Jackalope, Brown Shoe decided it was time to get back in the studio and begin recording the manically expansive and treacherous tale, The Gift Horse to be released fall 2011.